UPDATE: New Pics on Gothamist! A number of years ago, my wife and I looked at an apartment on Hicks St. in Brooklyn Heights, which we affectionately refer to as “The Rabbit Hutch,” very cute, and very small. Like most of Brooklyn Heights, it was still too expensive, but the real reason we rejected it was the lack of green space and parks in the area. If you live in a rabbit hutch, your going to have children, and they need parks. I am now kicking myself like Thumper, as there now there seems to be an abundance of parks in the area. The latest, the yet to open Pier 6 Brooklyn Bridge Park, appears to have a jaw droppingly awesome playground. Brooklyn Paper got a preview of the on going construction, and the playground will include Slide Mountain, Swing Valley, and Sandbox Village. Hopefully they will skip the “Scalding Orbs Town” that they have at the pier one park. It’s scheduled to open in June is supposed to also have a volleyball court, picnic area, and dining concessions from Ditch Plains Drop In, a Calexico Carne Asada truck, Blue Marble Ice Cream and Pier 66 Maritime, a wine bar, so parents can unwind while they await the paramedics to treat their child’s 3rd degree burns from the red-hot metal domes, and the broken clavicle from the 20 foot tee-pee slide fall. I kid! The PG looks awesome, and I’m really looking forward to Nate putting it through its paces. Look at an interactive map of all of Brooklyn Bridge Park here, or check out the live camera of the construction of the pier one park, it may serve as a guide to the sure to be huge line at Blue Marble. 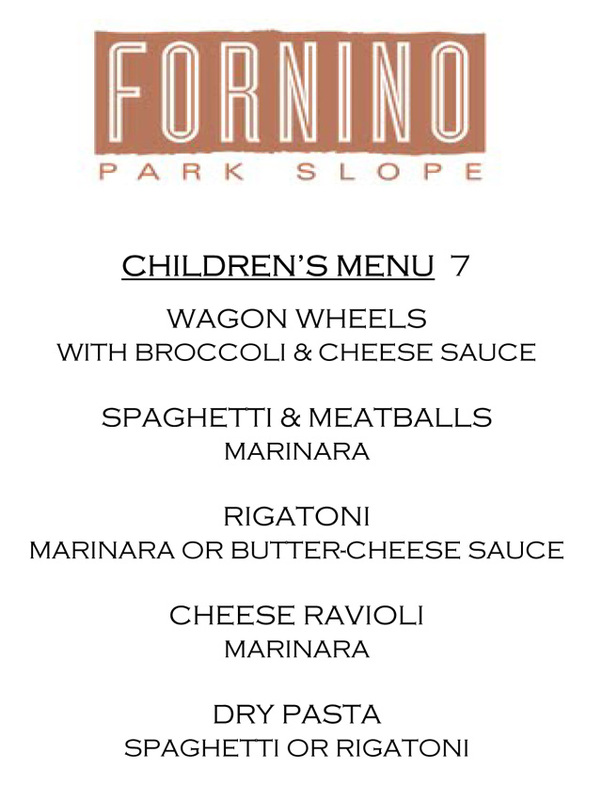 Gramercy Park restaurant, I Trulli, has no children’s menus and owner of, Nicola Marzovilla, doesn’t believe in them, “Children’s menus are the death of civilization.” But apparently they are welcoming to children, Mr. Marzovilla thinks children’s menus “aim too low” and wants to broaden the little ones’ pallets. I don’t take any offense to either attitude, but mainly because Nate pretty much gave up on children’s menus at 2 and a half, not enough food! We regularly get him a full entree, and he usually eats all of it. Although Nate can be a demanding diner, flagging down the waitress for more water or napkins, or food! So I’m looking forward to seeing if they will treat Nate like any other diner. But the real head-scratcher is why Mr. Ayoub would open a restaurant in Park Slope if he was so opposed to catering to children? Was he opposed to tattooed hipsters at his Williamsburg location? And for what it’s worth, I’ve had more meals disrupted by loud drunks than kids, and I’ve yet to hear any say restaurants shouldn’t serve booze.